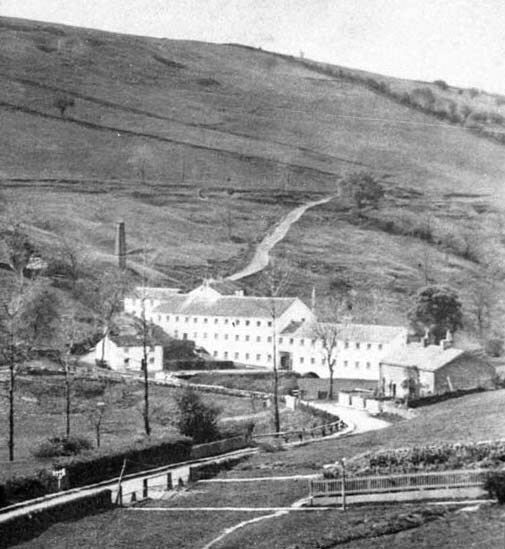 Located in the Dean valley about half way between Ingersley Vale and Rainow, this large cotton spinning mill would have dominated the valley. A few key features still remain, such as the wall arches spanning the River Dean, and the lower section of the building on the East bank, including the wheel house, which are all visible on the Google satellite image below (zoom in with the ‘+’). It was known as the White Shop because, unusually, it was whitewashed overall, picture right c.1860. The house at the front of the mill and the cottages at the near end still exist along Sugar Lane, Rainow. The mill was originally water powered with the head being established by the mill pond which remains today. 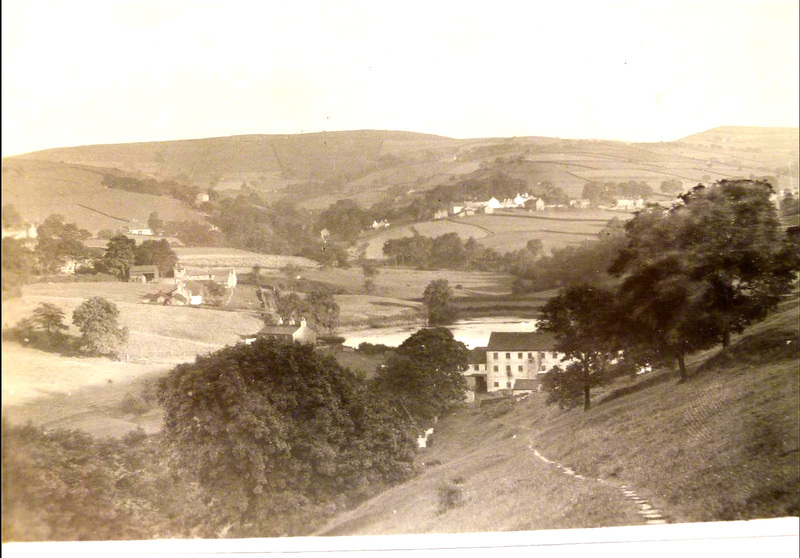 Interestingly, the mill pond, to the left of the picture, was empty when the picture was taken. It has water in it today. Later, steam power was employed with the boiler house chimney being sited up the hill in order to reduce the amount of building height needed. The roadway up Kerridge Hill behind the mill provided access to various small coal pits and a quarry at the top of the hill. It is probable that some of the coal for the mill came from these pits. The horizontal line marks the almost level track that extended from North End, Bollington, all the way to Kerridge End and was known as the East Sideway. Spelling – up until 1874 the maps record the name as Hough Hole. All the maps since use the Hough-hole spelling. 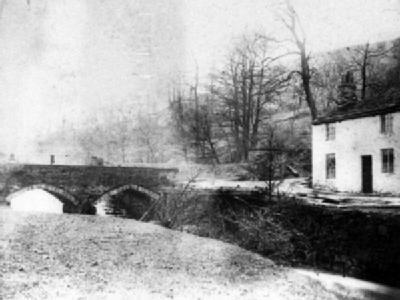 The picture, left, was taken looking from the front of the mill and shows the road bridge over the river Dean and the mill manager’s house, both of which still exist. The picture dates from the 1860s. The mill was located in the green field in the upper centre of the map. The dark area below is the still existant mill pond. The main picture above shows this area to be rough ground covered in vegetation. This suggests that the pond was out of use in the 1860s, further suggesting that by that time the sole source of power was the steam engine. My thanks go to those who researched and discovered the history that is presented in these pages. Please read the full acknowledgement of their remarkable achievement. My thanks also to John Greensmith, who updated me on those features of the mill still remaining!